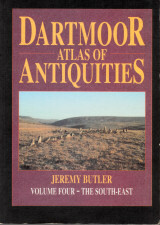 The table below lists the over 900 records of Dartmoor cairns listed in Jeremy Butler's classic 5-volume Dartmoor Atlas of Antiquities published in the 1990s. The listings should match those in the back of the first four volumes. Volume 5 contains sites not covered in the first four volumes but does not have these indexed. For example Mardon Down is not on the maps of the first four volumes. Sites missed in the earlier volumes due to oversight or because they were unknown at the time of publishing were covered in Volume 5. Some of these have been incorporated into the listing if it seemed appropriate to do so. 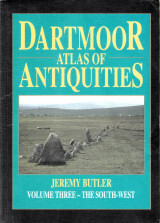 For example Haytor Down N. 1, 3 & 4 were not in the index in Volume 1. The others have been added at the end of the table below. Some records have been split up into separate entries. For example if a record refers to 6 cairns it maybe that 6 new entries are created in the database and the original record is then marked as a duplicate. 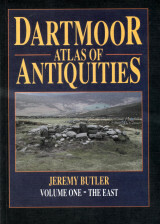 One issue that will become readily apparent is that the Prehistoric Darmoor Walks names are often different names to those used by Butler. Authors over the years have used a variety of fairly random naming conventions. 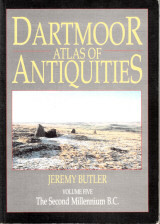 The names adopted by Worth and the Dartmoor Exploration Committee are probably the best known and many subsequent authors have stuck with these as they are well known from Worth's Dartmoor. Grinsell and Turner have introduced their own naming. Butler tended to refer to 6 cairns in a location and then number them 1 to 6 - ignoring any previous names which gives internally consistent way of naming sites but doesn't help with sites discovered afterwards or better known by other names! The cairns listed in the Prehistoric Darmoor Walks originally were restricted to those listed by Turner. Thus many of the names adopted originate from either Worth or Turner. Anyway, there has been no choice but to assign two names to many of the cairns. The PDW name and the often different alternative name or Butler name. The table below uses the later but the main listings across this website use the former with the alternative name given within the record. The Butler names have been slightly modified to make them more consistent. 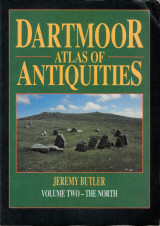 For example in Volume 2 there are 10 cairns listed as Bellever Tor (27.20.1 to 27.20.10). These have been numbered in the listing below - which is what Butler typically did with such entries although he did not do so consistently. The other difference is the site type e.g. Platform Cairn Circle and Cist, Encircled Cairn originates from the PDW categorisations and not from Butler. This page is a work in progress. For an explanation see the comments on the inter-related page of cairns listed by Grinsell. Refining and coding the output of so many records is quite a major undertaking and this is the first version of this listing. Rows given a light blue background indicate sites that no longer exist, those with a light salmon background are duplicate records. There maybe cairns mentioned in Volume 5 not yet incorporated into this listing - checking this is an outstanding task. The "-1" entries in the HER colum indicate that the HER has been searched and no matching record found rather than no search having been done. Curiously, there are over 100 such records which suggest that 100 records listed by Butler are not in the HER. Please contact the author if any errors are seen.